Dr. Schwarze specializes in vascular and endovascular surgery, clinical medical ethics and health services research. Her UW Health practice comprises all aspects of peripheral vascular health and she is particularly interested in preventive vascular care. 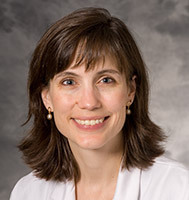 Her specific surgical interests include aortic aneurysm, carotid surgery, peripheral artery disease (PAD), endovascular therapy for vascular disease and minimally-invasive surgery. Dr. Schwarze’s research interests include clinical medical ethics and decision-making for surgical patients.